Whether Fall or Spring, wet weather seasons require the right boots to keep your kids’ feet nice and dry. The best rain boots for kids should be easy for them to put on without help, have a non-slip design, and, of course, have good waterproof capabilities to withstand the rain and mud. We reviewed these factors and more when coming up with our top 10 list of the best rain boots for kids. Recommendation: The Bogs Kids Solid Rain Boots are 100% waterproof to keep even the puddle jumpers dry. They’re some of the best rain boots for kids designed for both snowy and rainy weather. Made from durable, soft rubber, they’re comfortable, but there’s some concern with the lining coming apart. Their flexibility coupled with the pull handles makes them easy to put on. However, be aware that they can run big. Recommendation: Available in a handful of colors, these boots have a good, 8-in. height to them to keep water out. They’re 100% waterproof, and they’re easy to clean. The removable insoles help with additional comfort and durability. However, these unisex rain boots are heavy which can make kids a bit clumsy. Also, the pull handles help for quick slip-on, but they may not be that durable over time. Recommendation: Kids have plenty of opportunities to match their shoes to their outfits as the Ska Doo Kids/Toddler Rain Boots come in over 10 different colors. They’re rather comfortable for long-time wearing, but the calf area does seem a bit narrow with poor flexibility which may make it tough to tuck in pants. However, overall construction is durable and the non-slip treading keeps kids from getting hurt. Recommendation: Next on our best rain boots for kids list is this Hatley product. Their boots are simple and easy for kids to put on quick. They have enough colors to match every outfit too. The waterproof design is good, but the lining is fabric, so the inside can get wet. Also, the lining is prone to tearing after awhile. These are somewhat clunky and can be tough to walk in, but the soles are excellent at preventing slips. Recommendation: Kids can make a splash in these boots and you don’t have to fuss over cleaning as they wipe off easily enough. These trendy rain boots are comfortable to wear all the time, and with the rugged soles, kids experience fewer slips and falls. The sizing tends to be a bit off. At the same time, the foot space appears good, but the ankle can get too wide. Recommendation: Available in a number of cute, fun patterns, these boots are some your kid can wear whenever. Unfortunately, the patterns may wear off eventually due to consistent rainy weather. Nevertheless, these fun rain boots are super comfortable due to the soft rubber, easy to wash and able to fight off foot odors, making them ideal for daily play. Even though they can run too big that makes them great to grow in. Recommendation: The Kamik Raindrops are the best rain boots for kids who want to look stylish while wearing something that’s still practical. They come in cool colors as well, and they have a decorative side buckle. However, kids may have to break these in, and since they run a bit small they can be too narrow for some. Their practicality is quite good though, as they can take quite a beating and hold up through the strongest of rains. Recommendation: Next in our search for the best rain boots we have these Norty boots made from a waterproof rubber. They come in different colors and prints to complement every outfit and any tastes. Moreover, they also have attached fun handles for kids to pull them on by themselves. They are very comfortable and have fantastic grip and traction for the muddiest situations. Recommendation: These boots are designed with exclusive patterns that boys and girls are sure to love. They are comfortable to wear outside and around the house, but there isn’t much room if your kid’s wearing thicker socks. Putting them on is easy enough even if the pull handles can break off over time. These Lone Cone Rain Boots work well at keeping your kid dry and looking cool. 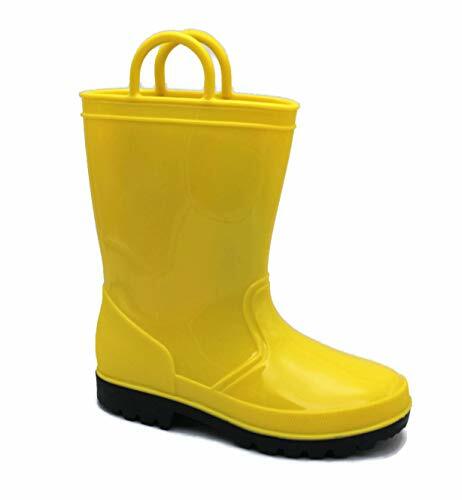 Recommendation: Next on our best rain boots for kids we have these synthetic boots that do an adequate job of protecting little feet from the rain. They come with easy handles so your kid can pull them on quickly, and they’re light in weight so kids have no problem walking. However, one of the biggest concerns is how small they run, they’re generally tight around the ankles, so buying a size or two up will help. Also, make sure they wear socks as they may rub without them. Comfortable but sturdy and well made. A lot of patterns to choose from. Inside is soft and the sole is thick with a really nice grip. Have a very strong rubber odor. They might run a bit large. Recommendation: These rubber boots are made from a 100% BPA free and nontoxic material for health reasons. They have a thick outsole that provides strong traction and keep water away. Moreover, they are made of a highly flexible rubber with a breathable EVA insole to keep kid’s feet dry and without odor. Besides being completely waterproof, they have pull-on handles that make them simple to put on for kids. Recommendation: Both practical and aesthetically appealing, these boots can easily be worn year-round. It’s clear why many deem these as the best rain boots for kids. They have large handles to aid with putting on and taking off, and the soles are remarkably sturdy so kids won’t slip even if they run. They may come across as heavy for little ones, and the rubber might tear over excessive use. Still, carter’s Rain Boots do a great job at fighting off muddy, rainy weather. Each pair of boots in our top 10 list made the cut for being highly waterproof, safe to play in, and easy for even the youngest of kids to put on. They’re all considered to be the best rain boots for kids, so whichever one you choose to go with will do just fine. You can also check out the best winter boots for kids. Let us know if you’ve tested any of these rain boots for kids as we’d love to know how well they worked!